Investors in the week ahead will be eyeing January’s advanced retail sales report from the U.S. Census Bureau, after the prior month registered gloomy numbers. Overall, U.S. economic releases are set to surge in the week ahead, while investors grapple with several uncertainties, including slowing Chinese growth and monetary policy shifts in Europe. U.S.-China trade negotiations and Brexit developments also remain risk-taking overhangs. On the corporate front, Bank of America Merrill Lynch will host its annual Consumer and Retail Tech Conference, and in fixed-income, the U.S. Treasury is set to auction new three-, 10- and 30-year government debt. U.S. economic releases are set to surge in the week ahead, while investors grapple with a long list of uncertainties, including slowing Chinese growth, monetary policy shifts in Europe, as well as trade negotiations and Brexit developments. Among the host of updates in the U.S., market participants will receive fresh reports on retail sales, inflation, durable goods, new home sales and consumer sentiment. Ward McCarthy, chief financial economist at Jefferies, had characterized December’s data as “truly dreadful,” and if taken literally, it would suggest the consumer sector “collapsed” in the month. He continued that the release was “such an outlier and so incongruous with the general trend in consumer spending, holiday consumer sales reports and holiday seasons consumer credit data” that it raised red flags about reliability. McCarthy added that the results were “sufficiently weak that it will no doubt fire-up the fear-of-recession anxieties that have percolated so many times this cycle. U.S. retail and food services sales for December fell 1.2% from the previous month to US$505.8bn, along with a downward revision for the October 2018 to November 2018 change to +0.1% from +0.2%. Year-on-year in December, clothing and clothing accessories stores were up 4.7%, while food services and drinking places were up 4.0%. Data collection and processing were delayed for this indicator release due to the lapse in federal funding from the partial government shutdown, which ran from December 22, 2018 through January 25, 2019. Meanwhile, the retail sales landscape may be adversely impacted by shifts in labor market activity, after a dismal headline number in February’s Employment Situation report, however a lift in Average Hourly Earnings (AHE) could offset negative effects. According to the U.S. Bureau of Labor Statistics, total nonfarm payroll positions increased by a paltry 20,000 in February – a punch to consumer confidence – while the unemployment rate fell to 3.8% from 4% in January. Employment in professional and business services, health care, and wholesale trade continued to trend up, while construction employment decreased. After revisions, job gains have averaged 186,000 per month over the last three months. While the number of job additions were far below market expectations, AHE lifted by 0.4%, contributing to a 3.4% year-over-year wage figure – better-than-anticipated. Market participants may also glean further insights into the U.S. retail environment, with Bank of America Merrill Lynch’s 2019 Consumer and Retail Tech Conference. A thick crowd of U.S. companies are slated to attend the event, including Macy’s (NYSE: M), Walmart (NYSE: WMT), Kroger (NYSE: KR) and WW (formerly known as Weight Watchers International – NASDAQ: WTW). 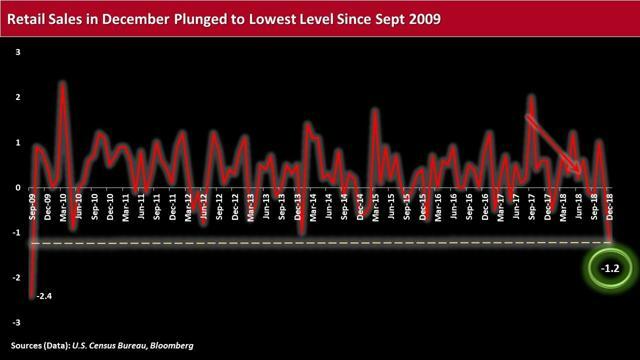 Retailers have generally reported mixed results for the latest quarter, with WW among the casualties. WW’s shares plunged more than 30%, for example, following their fourth quarter 2018 earnings announcement, while Best Buy’s (NYSE: BBY) stock rose over 15%. 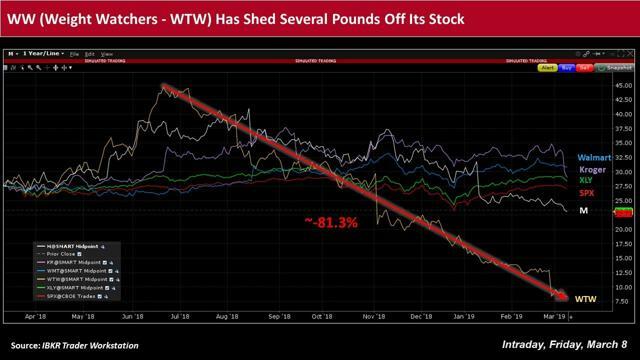 Finimize observed the Oprah-backed company’s profit was “well off its target weight, and it shed subscribers for the third quarter in a row.” WW also said that 2019 wasn’t going as well as hoped, lowering its outlook for the year. With the curtain’s final close on the latest earnings season, many investors focusing on retail may receive further, firsthand insights into the direction of WW, Walmart and others. 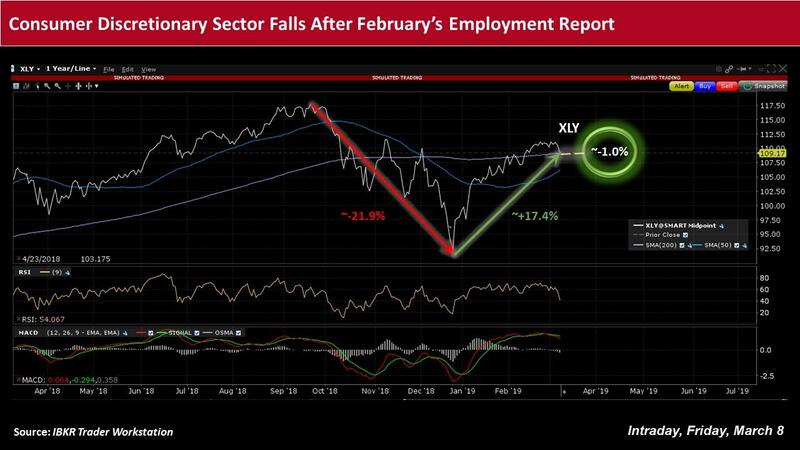 Note: This material was originally published on IBKR Traders' Insight on March 8, 2019.